When Adobe released Acrobat DC, it wasn't just a program upgrade; it was a complete overhaul. The name of the program remained the same, as did many of its functionalities, but the interface is nearly completely different. Most of the original functions still remain, but they are dressed up with new icons and often, new locations. But interestingly, some of the tools now seemingly have two different identities: the new and shiny, and the older and deprecated. 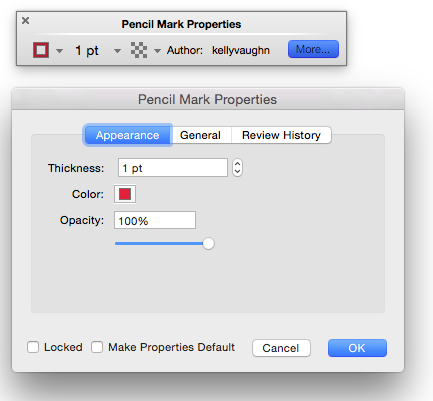 In today's post I want to explain the difference between the Properties Toolbar and the several of the Quick Tools. 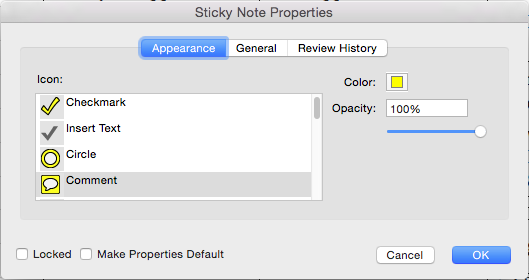 Here I have selected a sticky note. 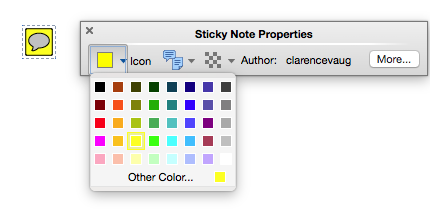 It is a plain, run-of-the-mill sticky note, with the default color and icon. I've displayed the old Properties Toolbar by pressing Ctrl/Cmd + E.
I have my choice of colors, icons, and opacity. It has everything I need in order to modify the properties of the sticky note. Sadly, for several years now, this toolbar can no longer be docked. From what I understand, it has been deprecated, and Adobe is no longer improving it. I miss the ability to dock the Properties toolbar, and I suspect that many others did as well, because in Acrobat DC, Adobe decided to change the tools so that the color choices would be available as part of the Quick Tools. What's interesting is that the default yellow color is not not of the choices in the Color Picker, which is why none of the colors are sleeted. 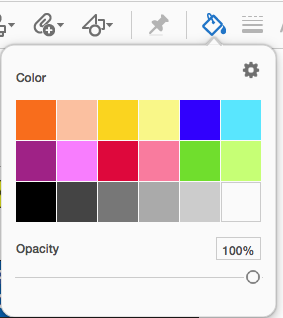 You'll know when the color is selected because it will have a big checkmark inside of the color square. 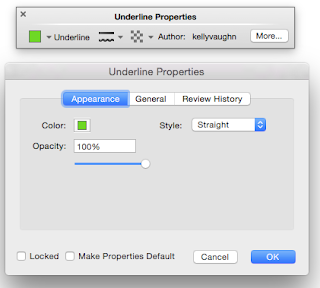 Choosing "Properties" or clicking on the "More... button on the Properties Toolbar will both bring up the Properties dialog box. The options available within the Properties dialog box will vary, depending upon which type of annotation (comment) is used. Lines and drawing markups have line thicknesses available, as well as both fill and stroke colors. Interestingly, the color fields are and "Color" and "Fill Color." So Acrobat views what we commonly know as the stroke color to be the main color. 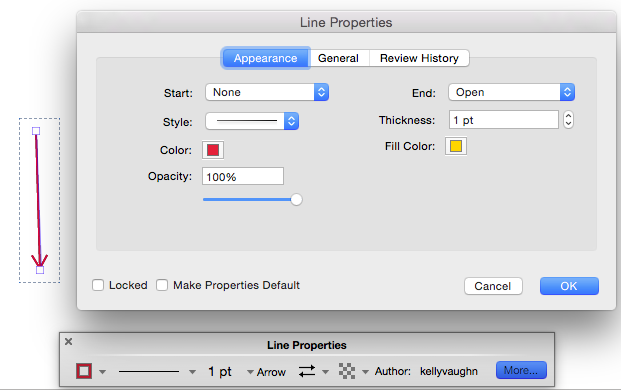 I wrote an entire article about that, and why I find it frustrating: Acrobat Rectangle Tool: Why Do You Disappoint Me So? 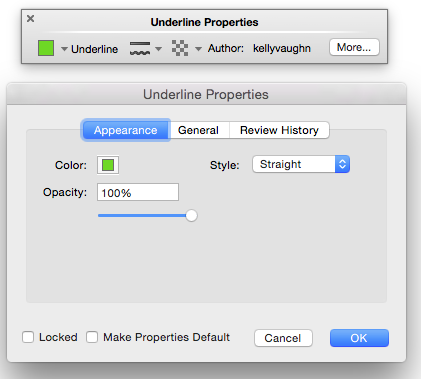 Most of the Properties dialog boxes are pretty straightforward, without too many options. But once you start dealing with text, the Properties dialog box and the Text Properties tool get more complicated. 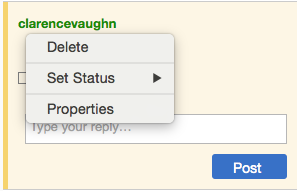 What's interesting is that the old Properties toolbar gives you WAY more options than the newfangled Text Comment Properties. In the new tool, gone are the options for bold, italic, subscript, and superscript. However, there is now a choice for increasing the line spacing, which is nice. I don't know that I'd ever use it, though. I use the text comments for filling out forms, rather than for typing paragraphs of text. Another interesting thing to note is that the Text Properties no longer works with the old Properties toolbar. 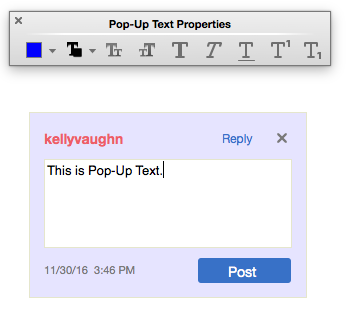 However, the pop-up text properties will still work with the old Properties toolbar. While I really like the new user interface of the Color Picker, Text Properties, and Line Thickness Tools, as well as how they be added to the Quick Tools, I still usually default to using the old Properties toolbar, because it offers more options: sticky note icons, start and end arrowheads, line style, type styling, and has many more color choices available. I really wish Adobe has incorporated all the options from the Properties Toolbar into the new quick Tools. Hopefully, they will address these issues in a future release, as they have done with other things I've complained about incessantly. This is one of the topics I discuss at length in my Lynda course on PDF commenting. If you need an easier way to control the properties of annotations in your PDF, check out my article on Bluebeam Revu. It's an amazing program designed specifically to meet the needs of users in Architecture, Engineering, and Construction. It has a huge Properties panel where you can edit all the properties of each individual object (right down to the X-Y coordinates and angle of rotation). 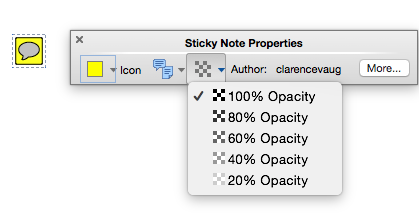 You can also edit the properties of the document itself right in that panel as well. It's amazing!